UNICEF delegates from Africa, Asia and global offices visited Oxford on 2-6 March 2015 to develop a shared programme of work and discuss opportunities for collaboration at global, regional and country levels. 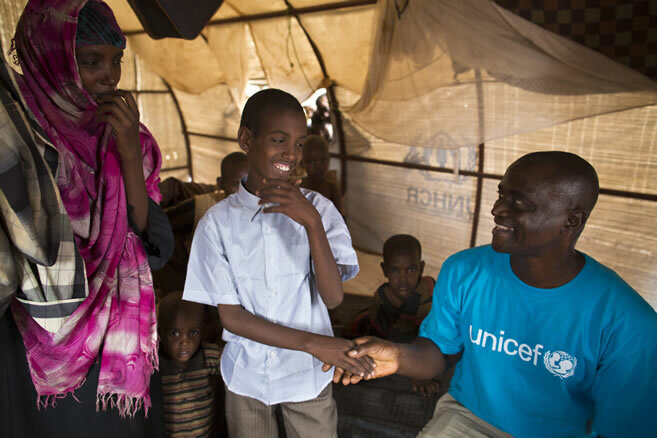 UNICEF will be our lead international practitioner partner in the REACH programme. The five-day meeting gave UNICEF practitioners and Oxford researchers the opportunity to share ideas about research priorities and improve the programme design. They discussed how best to connect the programme’s research with UNICEF’s work in order to deliver significant impacts for poor people facing water insecurity. Dr Sam Godfrey, Chief of WASH at UNICEF Ethiopia, delivered a public lecture about urban WASH and the emerging agenda for Africa. Extremely rapid urban growth in small towns will determine poverty pathways for hundreds of millions in Africa. The REACH programme will provide evidence on the sustainability of water resources that supply small towns, and the infrastructure and institutions needed to provide reliable access to water for people and industries. The partnership offers the unique opportunity to combine Oxford University’s water security science with UNICEF’s global practitioner network of country WASH programmes. UNICEF will enable the programme’s research to be translated rapidly into practical actions across Fragile States in Africa and Asia.